WHO WILL WIN PROMOTION TO THE GLO PREMIER LEAGUE 2012-2013? In this post, I will present some of the best players at the various clubs. Real Tamale United FC, often referred to as RTU, is based in Tamale in the Northern Region of Ghana. RTU, considered as a big club in Ghana, was relegated last season and has worked hard to get back their premiership status. Arguably, Abdul Aziz Yusif (born 10.11.1991) is the big star of the current team. 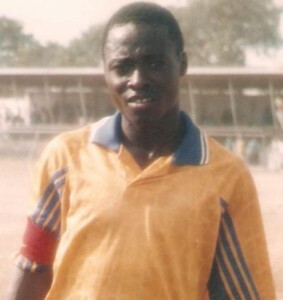 Yusif, a left-winger, attacking midfielder or striker, was signed from AshantiGold SC during the mid-season transfer window. He has plenty top level experience. Other key players include goalkeeper John Adjetey, captain and central defender Hanan Giwa, utility defender Hassan Mohammed, midfielders Yaw Papilin Mensah and Abdulai Abdul Karim (born 17.10.1991) and strikers Emmanuel Kwamena Quainoo and Ahmed Salim Sakara. I believe it is fair to say that Joshua Akoto (born 23.07.1989) is the star player of Unity FC, based in the small city of Goaso in the Brong Ahafo Region, mid-western Ghana. Akoto is a fast and strong striker. The picture is of Akoto and was found on http://proplayersagency.com. However, in my eyes, the most interesting player at the club is pacy winger Emmanuel Gyamfi. Gyamfi was part of the Ghana U-20 national football team in July and is apparently on the radar of Asante Kotoko FC. Other players at the club include Isaac Neequaye, most likely the former striker of AshantiGold SC. Amidaus Professionals FC is from Tema, a town on the Atlantic coast of Ghana. Key players include goalkeeper Eric Ofori Antwi, tough central defender Philip Ackah, Emmanuel Morgan, enterprising midfielder Benjamin Arthur, known for speed and skill, skillful winger Kofi Koomson, formerly of Tema Youth FC, striker Adjei Selasi and Richmond Roger Odongo (born 02.09.1991), formerly of Eleven Wise FC. Other players include Joseph Quansah and Matthew Dugah. 1995-born midfielder Derrick Appiah won a contract with the youth side of SS Napoli (Italy) after impressing for Amidaus Professionals earlier this season. Istanbul FC is from Techiman in the Brong-Ahafo Region, mid-western Ghana. It is difficult to find information about this team but Thomas Avorgbedor, formerly of King Faisal Babes FC, is apparently a key player. Adibo Gariba (goalkeeper) and Eric Buabeng (defender) have both been playing for the Ghana U-17 national football team this year. King Solomon FC is also based in Tema and it is very difficult to find information about the team. I believe midfielder Benjamin Scott Omari Yeboah and striker Danso Akoto Davis are key players.